Drawer that opens (pushes through) on both sides? I’m currently in the middle of designing a bed frame that has storage underneath. 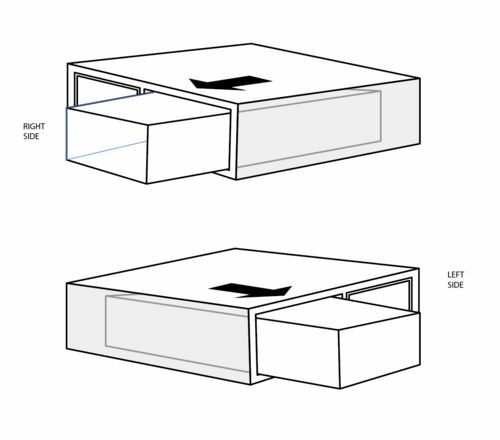 The storage system I’m trying to develop are two large drawers that have the ability to be pulled out on both sides of the bed with out restrictions. I have been trying to find drawer slides that allow for this movement but I have had no luck. I have also been trying to see if this type of drawer has a name, all I have been able to find is a “Peninsula Drawer” but that was a one time find. here is a quick illustration to help visualize it. What about a cleat attached to the carcass on either side of the drawer with a corresponding dado or 1/2 dovetail on each draw side. hefty drawers that would slide in and out with little effort. available from several online sources. I like John Smith idea on using roller balls. 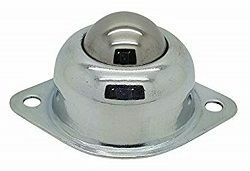 Menards, Lowes, Home Depot and Harbor Freight sells them. Mount them to the bottom of drawer or mount several in a row to the frame. They do roll very easy. I’ve mounted them on the bottom of milk crates and storage boxes for wood scraps. they roll out from under my work bench with little effort. Rockler has them https://www.rockler.com/accuride-9301e-heavy-duty-600-lb-full-extension-drawer-slides as grizzly has them https://www.grizzly.com/products/Fulterer-28-Drawer-Slide-100-lb-Capacity/T26450 The ones that pull out all the way with no droop are pricy. The drawer slides we have under our bed will pull out 3’ on not even droop. What functionality is gained by one drawer vs two other than the 1.5” of space used by two backs and a small gap? There is nothing wrong with wanting it a certain way, but I am curious as to the advantages. The only thing I can think of is being able to get at contents that are on the far side while standing on the near side. I am with Blue on this. I think it would be simpler to have 2 smaller drawers. Unless you plan or need to pull the entire drawer out one side for some reason, in which case you would need a really long slide depending upon what size bed this is for, I don’t see any advantage to having a single drawer that can be pulled out on both sides compared to 2 drawers. They are great for storing long items. Wrapping paper rolls, curtain rods, seasonal decorations, etc. I think J_J left out a critical piece of information. What sizes are these drawers? A light duty accuride isn’t going to work if the drawer is 5 feet deep. My bed is 5’ wide. Thanks. Since I have found myself a bachelor and my kids have moved out, I have forgotten about such things as I throw out unused curtain rods, buy wrapping paper when needed and don’t decorate based on the season. I do remember those days though! Man the pain it brings back! I remember bringing out the decor for Easter, Halloween, Christmas…. Thanks. Since I have found myself a bachelor and my kids have moved out, I have forgotten about such things as I throw out unused curtain rods, buy wrapping paper when needed and don t decorate based on the season. I do remember those days though! Man the pain it brings back! I remember bringing out the decor for Easter, Halloween, Christmas…. Yeah I personally wouldn’t care, but its all my wife’s stuff. Now in the garage, I have no place for my 3’ breaker bar. I always wanted to get the middle tool chest for my set, but never wanted to spend the extra money for the full width drawer. Hot damn, thank you for all of your replies. I do like the roller ball idea that John Smith provided, seems very minimalistic which is always good. I am with Blue on this. I think it would be simpler to have 2 smaller drawers. Unless you plan or need to pull the entire drawer out one side for some reason, in which case you would need a really long slide depending upon what size bed this is for, I don t see any advantage to having a single drawer that can be pulled out on both sides compared to 2 drawers. The reason for these two long drawers is so I don’t have to build four drawers and mount four drawers. These are two long drawers that are accessible on both sides of the bed and it gives room for longer items if need be. A more simplistic approach to over complicating a build with more. Just my take on it. I think J_J left out a critical piece of information. What sizes are these drawers? A light duty accuride isn t going to work if the drawer is 5 feet deep. My bed is 5 wide. Yes I did not mention the size of the drawer which would be between 5 & 5.75ft in depth.